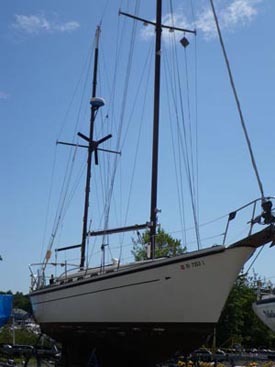 In the late Summer and Fall of 2009, I was off to find a new old boat to fit the plan. With some research, that had to be influenced in a large part by availability and more so by price, I decided on either a Pearson 36 or an Allied Princess 36 as being the boats I would look for. Either boat would be seaworthy enough for offshore cruising under most conditions and could be single handed,if needed, particularly if set up properly. So while I was looking for a buyer for my O'Day 290, I was actively searching for available boats to buy. Finding several available in the Southern Massachusetts / Rhode Island area, I made plans to kick some hulls during a visit to family in August, 2009. 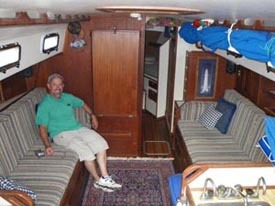 Having listed my boat for sale with lots of recently taken pictures, I assumed that the boats I was looking at on the broker's web sites were giving me a realistic picture of what to expect. Reality is, there are more than a few boats listed with pictures that were probably taken when the current owner bought the boat, in some cases, many years ago. Although I new I would be looking for a project boat, there were limits to how big a project I was willing to take on. I did finally decide on an Allied Princess 36 Ketch. 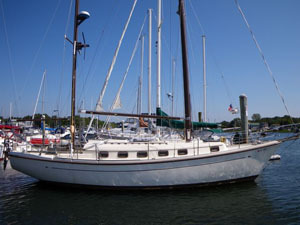 I returned to New England in Mid-September and after some close inspection, a survey, and a sea trial, I was able to negotiate a price that would fit my budget and allow a little surplus for the repairs needed. By the end of the month I owned a new old boat. Here are some photos of the Princess as I found her. 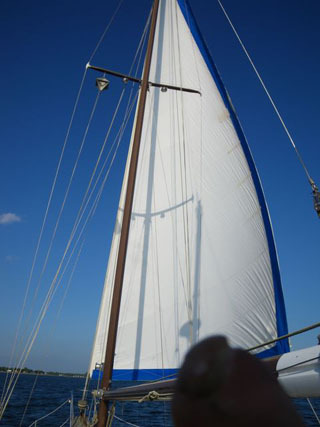 The photo up in the title was taken during our sea trail heading south on the westward passage of Narragansett Bay. The first look	I got of her on the hard and my brother Jordan, kicking back in her roomy salon. At the dock ready for the sea trial and cruising at 6 knots,(GPS), with only the genny. We had a successful sea trial, closed the deal, and it was time to move her to her winter quarters. "Fall 2009" was coming on.